When we have friends, we`re not sad, and what makes us happiest of all is a real friend. This is a story about what a real friend is and how to find one. Mika is sad because she doesn`t have any friends. In her kindergarten, there are lots of children who want to be her friend, but Mika doesn`t want to be their friend. Why? Noam hits, Omri kisses all the time, Rotem has big ears and Shachar is just a crybaby. Daddy takes a piece of paper and draws a friend with all the right qualities for Mika, but Mika doesn`t want a picture friend. Nothing much changes until one day all the children go out for a walk. Mika climbs a tree but can`t get down. Abigail runs to get the teacher, Ro’i explains to Mika how to get down, Orian comforts her, and some children don`t say a word. Only Yuval climbs the tree and helps her to get down. 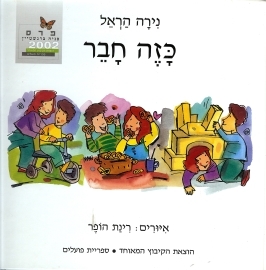 At lunchtime, Mika offers him some from of the food her mother has prepared from her, and when the teacher tells the children to dance, Yuval chooses Mika as his partner. Daddy and Mommy can see that Mika isn`t sad anymore and realize that she has found a friend at the kindergarten. Yuval hits a bit, and Mika hits back; he kisses her, and she kisses him back; he cries sometimes and he doesn`t look exactly like the friend that Daddy drew. As for his ears - Mika doesn`t know if they`re big or small, because they`re hidden by his curls. In short, when you have a real friend, it doesn`t really matter what he looks like, and it doesn`t really make any difference if your friend`s qualities live up to your ideal model. That`s how it is when we’re children and that`s how it is when we`re big.